← Look Mommy I Pulled Out My Tooth! If your like me the end of the school year, although a joyous occasion, seems to sneak up on me. June seems to fly by and suddenly it’s the night before last day of school and I am totally unprepared and have no teacher gifts. There is usually a harried dash to CVS to buy gift cards. It can be frustrating and annoying because by the time I get to the gift card rack the pickings are slim and it’s difficult to find one I like in the denomination I am looking for. Normally I end up getting a Visa or Amex gift card but then resent the service fee they charge. But those days are over! I have found the perfect teacher gift that can be bought at the last minute. Unfortunately, I can’t take credit for this one it was my sister-in-law’s idea. 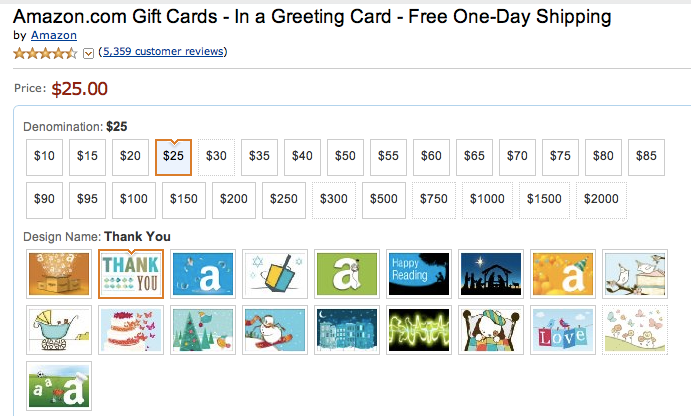 Amazon Gift Cards with a free greeting card is the absolute perfect gift with loads of options. There are various styles available to choose from, I chose the Thank You style for the teachers. You can also choose almost any denomination you would like. You can even personalize the card with your own message. How great is that? What’s even better is no service charge and free overnight shipping. This might be the greatest idea ever! I just wish I had thought of it. I happily ordered gift cards for all the teachers, helpers, and special area teachers today. 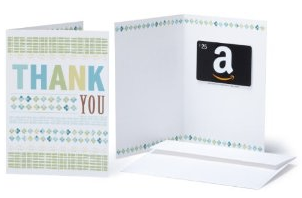 The gift cards will be here tomorrow in plenty of time for the last day of school. This entry was posted in Family, Life, Motherhood, Shopping and tagged amazon, amazon gift card, amex gift card, free greeting card, free overnight shipping, Gift card, Greeting card, last minute teacher gift, Teacher, teacher gift, thank you, visa gift card. Bookmark the permalink.